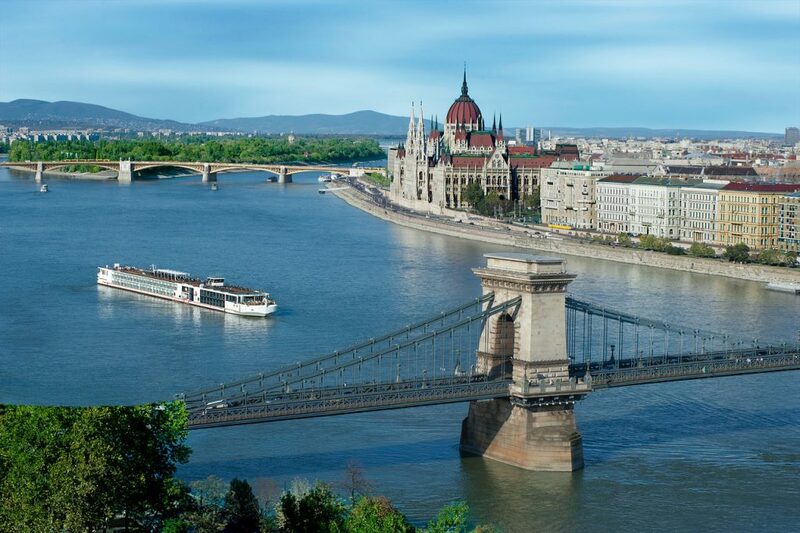 My cruise from Budapest, Hungary to Passau, Germany will pass through four European countries over eight days, with six included guided excursions. I’ll take a non-stop flight from Philadelphia to Budapest, and then embark on the Viking Vilhjalm, a Viking Longship with streamlined Scandinavian design and understated elegance. My home for the next eight days will include a 205 square foot Veranda Stateroom with a floor-to-ceiling sliding glass door opening to a full-size veranda. It also includes a 40-inch Sony TV with On Demand, plus CNBC, CNN, FOX, National Geographic and more. My room also includes a bathroom, safe, refrigerator and twice-daily housekeeping. Free Wi-Fi is available all over the ship. The main restaurant serves breakfast, lunch, and dinner, or you may opt for breakfast and lunch in the Lounge or take a plate to the Sun Deck. A bar-style menu on the Aquavit Terrace offers opening seating several nights during the cruise. Soft drinks, wine, and beer are complimentary during lunch and dinner. Premium selections come at an additional fee. I have been to Budapest before, but will be thrilled to return for a cruise past by the dockside Parliament Building when illuminated at night. It’s a sight so stunning, once is never enough. Can’t wait for a stop in Bratislava, the capital of Slovakia, where I’ll take a walking tour of the restored baroque city palaces and squares. I’ll see St. Martin’s Cathedral where 11 Hungarian kings and eight queens were crowned. Day 5 will be spent in Krems, Austria visiting the working monastery at Gottweig Abbey. Then, I’ll sit back and enjoy the scenery of the Wachau Valley from the decks of the Vilhjalm. This 18-mile UNESCO World Heritage site abounds with scenic vineyards and monasteries. I’ll also visit Melk Abbey known for its fabulous library, medieval manuscripts, frescoes, and grounds. Day 6 promises a full day tour to Cesky Krumlov in the Czech Republic. The Bohemian village is a photographer delight – – I’ll have my camera ready. Day 7 brings the ship to Passau, Germany known as the “City of Three Rivers.” I’ll take a walking tour and hear an organ concert. I’m sure Viking will prepare a special last night dinner where I’ll party with the new friends I’ve met on the cruise. The next morning I’ll be transported to Munich airport for my flight back to the States. This is my second Viking River Cruise, and I couldn’t be more excited. My previous experience with Viking ranked as top notch, beyond my expectations. I am sure the Danube Waltz will even surpass those memories.